Problems like these were a little less common just a few short years ago. However, with the invention of wireless printers it has become quite a regular occurrence. Why? Quite simply, wireless technology requires more moving parts to get it to work then the old plug and play printers of the past. However, I think we all can agree that the convenience of being able to print from anywhere (and I mean anywhere) in the world to your wireless printer is nothing short of a miracle and well worth the occasional frustration. So what causes our wireless printers to rebel against us? There are several things that can trigger the dreaded error messages that casually slink across the bottom of our computer screens (usually at the most inconvenient times too). Let’s take a look at a few of them and how to troubleshoot them. Loss of Internet Connection – This one might seem obvious but frequently many of us assume the internet will always be there and therefore rarely suspect that the culprit might be an internet issue. Many things can cause the internet to disconnect including a recent storm, the internet provider having problems or updating their service, or someone accidentally hitting the off switch on the wireless router. Sometimes a simple reset of the router can solve everything in a few short minutes. Wireless Router Issues – As mentioned above, sometimes the issue is not the printer at all but instead a problem somewhere else in the myriad of devices that make the whole wireless thing work. If you determine that there is a signal coming from your internet connection, you may want to look at the router next. Computer Settings Issues – Sometimes, especially in this era of auto-updates, when our computer’s OS gets updated it can mysteriously reset our computer settings messing up the settings the printer needs to work correctly. This can also happen anytime you add a new program or software to your computer. Computer Updates Issues – As mentioned above, sometimes when computers’ operating systems, software, or hardware is updated or upgraded it can mess up settings that your printer and other devices require to run correctly. So anytime you start to have printer issues think about what has changed recently on your computer that might have upset your printer settings. Printer Settings Issue – As with computer settings, printer settings can get messed up any number of ways – by auto-updates, someone changing a setting, or if you lose power and everything shuts down for some time. Printer Updates Issues – Sometimes when updating any software there is an error during the process and the file might be corrupt or missing a vital part. When this happens it can cause any number of issues. 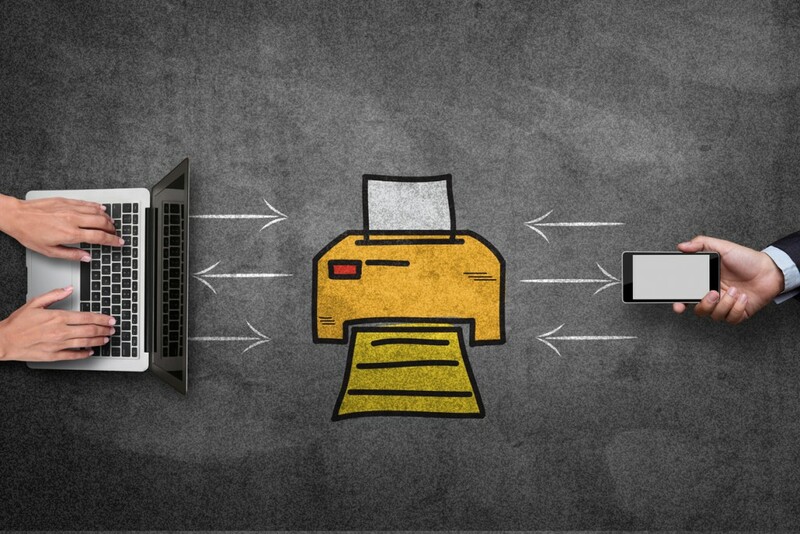 Paper Jam or Ink Supply Low – Paper jams and low ink supplies happen all the time but sometimes it’s the last thing we think of when the printer is acting up. We know wireless printing issues can be maddening, however, before you resort to taking a baseball bat to your technology try some of our suggestions below first. Check the printer queue – It may sound like common sense but how many times have you had printer issues only to find out after an hour of trying to get it to print that there is one lone print job from last week that didn’t print and is stopping your current print job from printing? It’s happened to all of us more than once I am sure. So the first thing to always check is your printer’s print queue. It will list the status of all print jobs and whether they have an error or not. Also, make sure that you are sending the job to the correct printer. That can be equally maddening. Connect the printer to your computer via USB cable to determine whether it is a wireless signal issue or something else. If you connect the printer to your computer via USB cable and the printer works then you definitely know it’s a wireless issue. 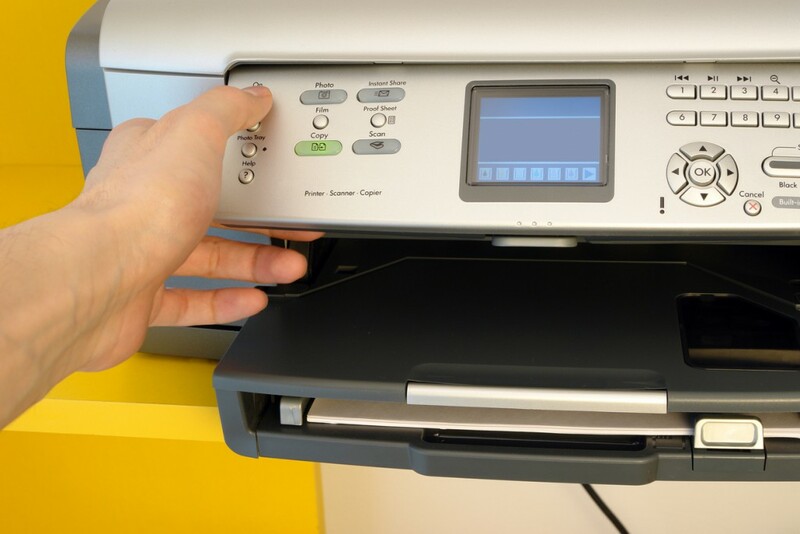 However, if you connect the computer to the printer with a USB cable and the printer still doesn’t work, you now know that the issue is likely a software or printer issue. Having this information can help point your troubleshooting in the right direction and onto a quicker resolution. Confirm your device is on the right network. We’ve all done this at some point or other. You send something to the printer and wait…and wait…and wait….only to find out your device automatically connected to a wrong network. Make sure your device is on the correct network by confirming it in your settings then try printing again. Reboot – Sometimes we all need to reset and our electronics are no different. The longer a program has been continuously running the more likely there will be an error or a hangup that can only be reset but shutting everything down, giving it a moment, and then starting it back up. By doing this you’re giving the device and all the software on it a chance to start over, which eliminates any communications or syncing errors that may be causing an inability for your printer, router, or computer to talk to each other. Sometimes by simply rebooting everything you can resolve the issue entirely. Update all software and drivers for computer, printer, and wireless router – This one is probably the most common culprit when it comes to printing issues in our opinion. Ever since Windows 10 came along and their automatic updates kicked in there is almost always a direct correlation between wireless printer issues and a recent Windows update. So if your printer mysteriously starts having issues check to see if Windows has recently done an update of the OS. If there has been there is a good chance that either the update failed or was corrupted or the update requires your printer’s driver to be updated to be compatible with the Windows update. It could also mean that the update reset all the settings for your printer and you need to reset them all again. You can’t necessarily avoid these issues however, you can make it a habit to update all software as well as drivers for your computer, printer, and wireless router any time there is a major Windows update. This way you are more likely to have all your technology cooperating nicely. Generally when an OS gets updated all the other software needs to be updated to be compatible again. Relocate the printer – If after doing all the above you are still having wireless printer issues, try moving the printer. Remember, when you are printing wirelessly you are not just sending the document from your computer directly to your printer. Wireless technology requires the print job to go from the computer to the wireless router and then to the wireless printer. If the computer is too far away from the wireless router or there are thick walls or furniture in between the two, the signal might not be strong enough to carry out the print command. Moving the printer and the wireless router closer to each other just might do the trick and resolve all printing issues. Reset the printer to factory settings – Okay, so you’ve tried all the other options above and you still haven’t found a resolution to your wireless printing issues. Now we offer you the choice of (almost) last resort. One that is often called the ‘nuclear option’ so do not take this one lightly – and that is to reset the printer to its factory settings. This means that the printer will go right back to the way it was the day you took it out of the box and it will have to be set up, reconfigured, and updated to get it to work again. However, it will usually resolve any issues that you haven’t been able to solve. 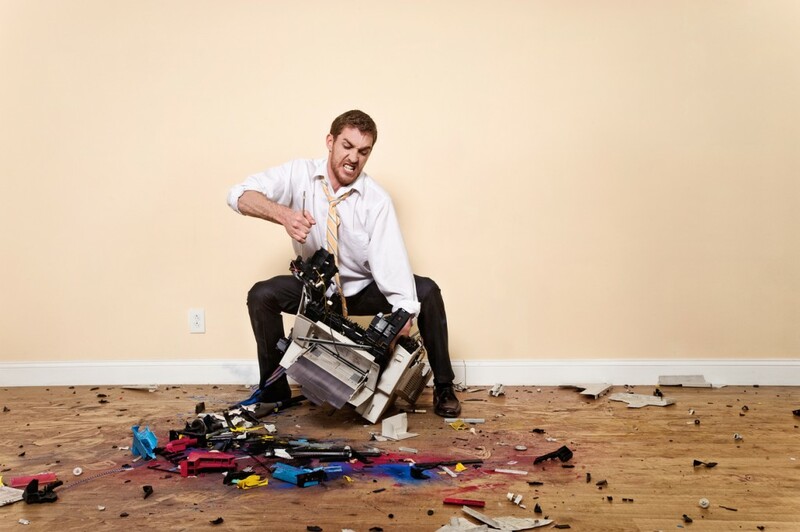 Buy a new printer – And last by not least is the REAL nuclear option – chucking out the old and buying a new printer. Depending on how long you’ve had the printer this might be your only option at being able to print again. Electronics have a end of life date and printers are in the range of 3-5 years. After that they start having issues with compatibility and just generally begin to break down. Also, manufacturer’s generally stop updating software on their older printers once they have several newer models out which will start to cause incompatibility issues with newer electronics. So if your printer is continuously having issues that are hard to resolve or can’t be resolved you may have reached this point in its life cycle. At that point it’s time to go shopping for newer and better and get back into the printing game.